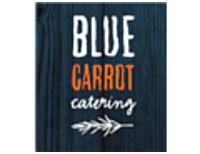 Blue Carrot Catering provides creative catering to suit any occasion. We will create a personalised menu to suit your budget and culinary tastes. We can assist with hireage of cutlery, crockery, glassware, linen and wait staff/chefs. We are owner operated Caterers and work from a modern kitchen in central Wellington. While we will successfully cater for any size or style event, we specialise in corporate catering, wedding catering and private catering.